We all seek comfort when it comes to dressing up, and this combination of a black leather biker jacket and a Miu Miu matelass pearl detail shoulder bag is a practical example of that. Choose a pair of charcoal low top sneakers to instantly up the chic factor of any outfit. If you're all about relaxed dressing when it comes to your personal style, you'll love this extra adorable combination of an olive parka and a Miu Miu matelass pearl detail shoulder bag. Grab a pair of black leather loafers to va-va-voom your outfit. If you're all about practicality dressing when it comes to your personal style, you'll love this cute combination of a blue denim jacket and a Miu Miu matelass pearl detail shoulder bag from farfetch.com. Wearing a pair of black sequin low top sneakers is a simple way to add some flair to your getup. If you're a fan of relaxed dressing when it comes to fashion, you'll love this absolutely chic pairing of a grey crew-neck sweater and a Miu Miu matelass pearl detail shoulder bag. A pair of black studded suede ankle boots will add some real flair to this outfit. 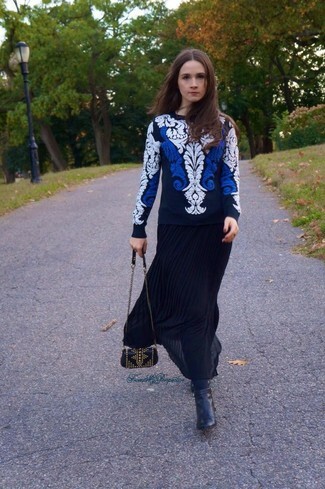 This combo of a black ruffle crew-neck sweater and a Miu Miu black studded leather crossbody bag gives off a so-chill and effortless kind of vibe. Complement your look with a pair of black leather ballerina shoes to effortlesslly dial up the wow factor of any ensemble. If you're a fan of relaxed dressing when it comes to your personal style, you'll love this extra cute pairing of a black coat and a Miu Miu matelass pearl detail shoulder bag. When it comes to shoes, this getup is finished off really well with black embellished low top sneakers. If you're all about relaxed dressing when it comes to fashion, you'll love this adorable combo of a white and navy embroidered crew-neck sweater and a Miu Miu matelass pearl detail shoulder bag from farfetch.com. Rock a pair of black leather ankle boots to va-va-voom your outfit. 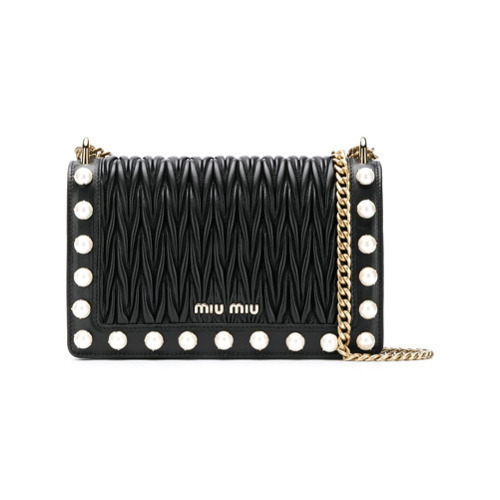 If you're searching for a casual yet absolutely stylish ensemble, consider wearing a white and black fur coat and a Miu Miu matelass pearl detail shoulder bag. Both items are super comfy and will look fabulous when paired together. Add black elastic ankle boots to your look for an instant style upgrade. We all want comfort when it comes to dressing up, and this combination of a white and black leopard crew-neck sweater and a Miu Miu matelass pearl detail shoulder bag from farfetch.com is a practical illustration of that. Elevate this getup with black leather over the knee boots.